Researchers from Stony Brook University, the University of Texas, Emory University, and the Institute for Systems Biology, developed a deep learning system that maps how the immune system fights cancer. The study, published in the journal Cell Reports, has the potential to help pathologists more precisely define cancers and develop better treatment plans for cancers that are responsive to immune-based therapies. 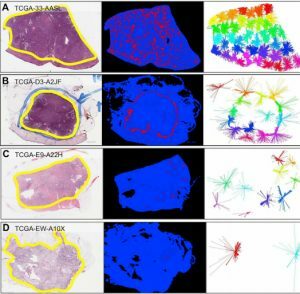 “This paper demonstrates that we can now use deep learning methods such as artificial intelligence to extract and classify patterns of immune cells in ubiquitously obtained pathology studies, and to relate immune cell patterns to the many other types of cancer patient molecular and clinical data,” Joel Saltz, chair of biomedical informatics at Stony Brook University told the University publication. Using NVIDIA Tesla GPUs and the cuDNN-accelerated Theano deep learning framework, the team trained their convolutional neural network on almost 25,000 annotated images and validated it on a separate dataset of around 5,500 images. The images used to train the neural network included 13 types of cancer from 4,700 patients. Once trained, the algorithm detects tumor-infiltrating lymphocytes (TILs), called TIL maps which, according to the researchers, will enable cancer specialists to develop tumor-immune information from routinely gathered pathology slides. 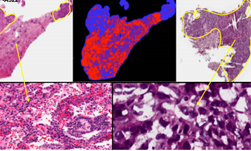 Left: diagnostic image at low magnification with tumor regions circled in yellow; middle: TIL map; red represents a positive TIL patch, blue represents a tissue region with no TIL patch, while black represents no tissue; right: diagrams of clusters of TIL patches. Line segments connect cluster members with a central representative for each cluster, and colors are arbitrarily assigned to aid visual separation of clusters. “Developing machine learning tools such as this proof of principle project to map lymphocytic infiltration patterns is important for research reproducibility in immune-oncology and will also allow these approaches to begin to be deployed as decision support for pathologists as we evaluate and report our cases for routine decision-making,” said Alexander Lazar, Professor of Pathology & Genomic Medicine at the University of Texas. The researchers say they will continue to investigate the use of digital archiving of pathology and the use of artificial intelligence to enhance diagnosis and treatment of cancer.